I make! Low carb (gluten free) pizza crust edition | Random moosages as I see fit. A-pusher: You know that begging strip commercial? I think it’s well known that I really like pizza (and chocolate). So…recently I made another pizza. This time with a low carb/gluten free crust. No, I’m not jumping onto the bandwagon of low carb/gluten free. Yes, it is a bandwagon. I tried it because I had to get rid of some cauliflower and I found this recipe that uses cauliflower (among other things) for the crust. I swapped out the skim mozz for a 6-cheese Italian cheeses blend because it’s what I had and the parm for a 5-cheese blend, also because it’s what I had on hand. It takes a little while to prepare since you have to grate and parcook the cauliflower and then parbake the crust. But the overall result wasn’t bad. One pizza was topped with store bought tomato sauce, green bell, onions, garlic, grape tomatoes, mushrooms, and ham. The other was topped with fresh tomatoes, green bell, onions, lots of garlic (I had to get rid of it), and the rest of the ham (yusssss! finally got rid of all the ham!!). When the pizza is still quite hot, you can taste the cauliflower. It’s not unpleasant, unless you don’t like cauliflower. In which case, you probably shouldn’t be cooking with it. As the pizza cools, the taste becomes fainter. The texture is…soft. I wasn’t expecting it to crisp up or anything but I don’t think I was expecting it to be quite as soft as it was. The crust did hold up though. 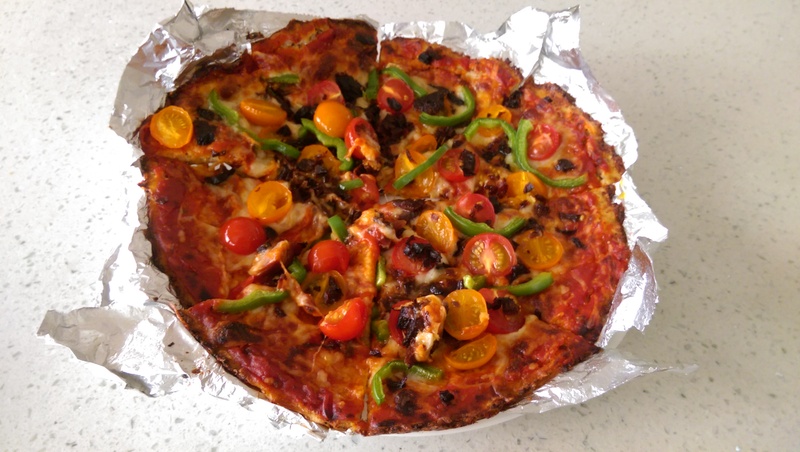 There was some problem with sticking on the first pizza as I used foil instead of parchment. But you were generally able to peel the foil away and still have a pizza slice. The second pizza I used foil again but sprayed canola oil on the foil. That one was much easier retrieve the pizza off the foil. Overall, I’d say it’s a pretty decent way to use up cauliflower in a hurry. It also made the calorie count much lower than a normal pizza. So…I might have eaten a whole pizza in one sitting. I may have regretted that after because low cal or not, it was still a lot of food. And yes, I know that any pizza is a personal pizza if you try hard and believe in yourself. But it was still a lot of food.